yəhaw̓ is an Indigenous-led, yearlong project that includes satellite installations, performances, workshops and trainings, artists-in-residence, art markets, a publication, and partner events at more than twenty-five sites across Coast Salish territories and beyond. Our programs are accompanied by relationship-building and mentorship opportunities to support continued artistic development in our communities, with the intent that all participants will gain experience and exposure, and build sustaining connections. The exhibition at ARTS at King Street Station, running from March 23-August 3, 2019, is the centerpiece of yəhaw̓. The title of the show is drawn from the Coast Salish story of people from many tribes uniting around a common cause and lifting the sky together. In the spirit of that story, we used a decolonized curatorial process, inviting all Indigenous individuals living in the region to participate. As a result, the gallery features work from over 200 exhibitors. Participants come from urban and reservation communities, use many types of media, and range from master artisans and Elders to youth and emerging creatives who are exhibiting their work publicly for the first time. We hope that yəhaw̓ reflects a nuanced, inclusive narrative that firmly establishes the vital contributions generated by Native thinkers and makers here, and now. By organizing an opportunity for community to speak for itself through a wide range of individual - and sometimes opposing - perspectives, yəhaw̓ un-settles assumptions and centers Indigenous action, Indigenous innovation, and Indigenous agency to author our own stories. We raise our hands to all the Indigenous artists, the Office of Arts & Culture, and the partners who have helped to realize this project. Thank you for your trust, your generosity, and your willingness to learn with us. Together we lift the sky. Please see the Visit page for more information and to schedule a tour. Please note, our budget is still in flux as expenses arise and new funds are secured, but in the spirit of transparency we are sharing our current planned expenses from 2016 - March 2019. These numbers reflect the monies we route through our fiscal sponsor Na’ah Illahee Fund, and do not account for costs that are paid out directly through our partners as part of joint programs, which together make up more than $20,000 in additional dollars going to Native artists and community events. We would like to acknowledge that we are on Indigenous land, the traditional territories of the Coast Salish people. yəhaw̓ is committed to creating programs free of harassment, discrimination, sexism, and threatening or disrespectful behavior. yəhaw̓ is intended to be a safe space for all people, especially Indigenous women, femmes, young people, and those most vulnerable in our communities. We reserve the right to deny access to, or remove from our events and venues, those who have violated the sacred and remain unrepentant with no movement towards healing and reconciliation. If you have exhibited behaviors that make others feel uncomfortable, or unsafe, we encourage you to begin a conversation with the curatorial team (Tracy Rector, Asia Tail, and Satpreet Kahlon), and for the sake of larger community values and empowerment of the artists in our show, we request you remove yourself from yəhaw̓ programming while we address the circumstances. Similarly if you have had negative experiences with anyone affiliated with yəhaw̓ please contact us. We are committed to doing everything in our power to minimize harm. Email info@yehawshow.com, call or text 253-336-6477, or use the contact form on yehawshow.com. Check the events page on this website for upcoming public programs. 10 emerging artists were selected to participate in our training program to develop new work for the yəhaw̓ exhibition under the guidance of a mentor artist. Mentor artists - Ka'ila Farrell-Smith, Ryan Feddersen, and Roger Fernandes - will each work intensively with a small cohort of mentees in Portland, Tacoma, and Seattle respectively. The program will include group critiques and additional professional development activities. As an extension of the mentorship program, Artist Trust will provide 3 free professional development classes for yəhaw̓ creatives covering topics like: Artist Statements and Biographies, Resumes and Budgets, Applying for Grants, and Work Samples Dos and Don'ts. Allison Bishins Consulting will also teach a free class on Social Media Marketing. Cowlitz Tribal Health therapists will provide a class on healthy strategies for dealing with rejection through a cultural lens. The Seattle Public Library and yəhaw̓ hosted a series of Indigenous artists in residence in fall 2018 - Native Kut (Pah-tu Pitt and Sean Gallagher), Fox Spears, and Roldy Aguero Ablao. The residents each activated the right side of the 8th floor gallery in the library’s main branch for 3 weeks between October and November, including artwork displays, live-art making, and community engagement activities, all relating to themes of water and environmental justice. All of the artists participated in a public panel discussion following the residency period to share their experiences working in the library. Indigenous artist Denise Emerson also served as the curator in residence at the library. The curator in residence worked closely with the yəhaw̓ team to organize and install an exhibition of Coast Salish art on the left side of the 8th floor gallery of the central branch displayed October through December. SAM is partnering with yəhaw̓ to host an Indigenous artist for their 2019 Olympic Sculpture Park Residency that will culminate in participatory art encounters January 25th and February 22nd. In collaboration with the City of Seattle's Office of Arts and Culture, yəhaw̓ creatives will be selected as the first artists in residence for King Street Station, and will activate the glass-walled studio space in the gallery for the duration of the exhibition. We are partnering with Pratt Fine Arts in Seattle to give yəhaw̓ artists free access to their metalworking, printmaking, sculpture, wood, and other studios through the end of the 2018. Indigenous artists have been invited by the yəhaw̓ curatorial team to create commissioned artworks responding to the Lifting the Sky story for the exhibition space and on the plaza of King Street Station, accompanied by commissioned performative works that will debut at the opening celebration. Outside of these special commissions, all yəhaw̓ artists will be paid a modest honorarium to acknowledge their time and their contribution to the show. The yəhaw̓ team is working on a series of additional special projects, including an all-Indigenous fashion show, a curated poetry zine and reading events, the activation of King Street Station's plaza in conjunction with the Seattle Art Fair, and an installation as part of the University of Puget Sound's Race and Pedagogy Conference. Tracy Rector is a mixed race (Choctaw/Seminole) filmmaker, curator, community organizer, co-founder of Longhouse Media and a 2016 Stranger Genius. She has made more than 400 short films, and is currently in production of her fifth feature documentary. As co-producer of the award-winning film Teachings of the Tree People, producer of March Point, co-director of Clearwater, and director of Ch'aak' S'aagi; Rector has developed an awareness and sensitivity to the power of media and film as a modern storytelling tool. After years of galvanizing community and working in a directorial role, Rector has begun to transfer her method of storytelling to gallery exhibitions including RE:DEFINITION at the Paramount Theatre Gallery, YOU ARE ON INDIGENOUS LAND at Core Gallery, Women On the Brink at Vermillion Gallery, and BLOODLINES at Bridge Productions. Asia Tail is from Tacoma, Washington where she is currently based. Asia attended the Cooper Union School of Art in New York on a four-year full-tuition scholarship and graduated with a BFA and the Brandon Burns Stewart Memorial Prize for Excellence in Painting in 2014. Her work has recently been featured in NW Art Now @ TAM (formerly the Northwest Biennial), in Quota at SOIL Gallery in Seattle, and in the two-person show Moon Moan at 950 Gallery in Tacoma. As an extension of her art making practice, Asia also curates special projects and exhibitions, with an emphasis on empowering Indigenous artists. She is a citizen of the Cherokee Nation of Oklahoma. Satpreet Kahlon is a multidisciplinary artist who is based in Seattle, WA + Providence, RI. Born in Punjab, India and raised in the Midwest, she is interested in creating visual language and immersive encounters that express and explore intersectional experiences as well as the structural systems of inequity that dictate their boundaries. In addition to her studio practice, which has been featured in Artforum, she curates with a philosophy of embedded equity at The Alice Gallery in Seattle, is the founder of Deep Space Gallery, and, between 2015 and 2017, she designed and taught social engagement programming in partnership with the Seattle Art Museum. She is currently studying at the Rhode Island School of Design, where she received a full fellowship to pursue her MFA in Sculpture. Jessica Ramirez is the Community Curator for the Indigenous Latinx Exhibit at Vermillion Gallery. Jessica is a queer fourth-generation Mexican American. She was born and raised in Corpus Christi, Texas and has lived in Seattle for 15 years. She is a media creator, events producer, and community advocate. 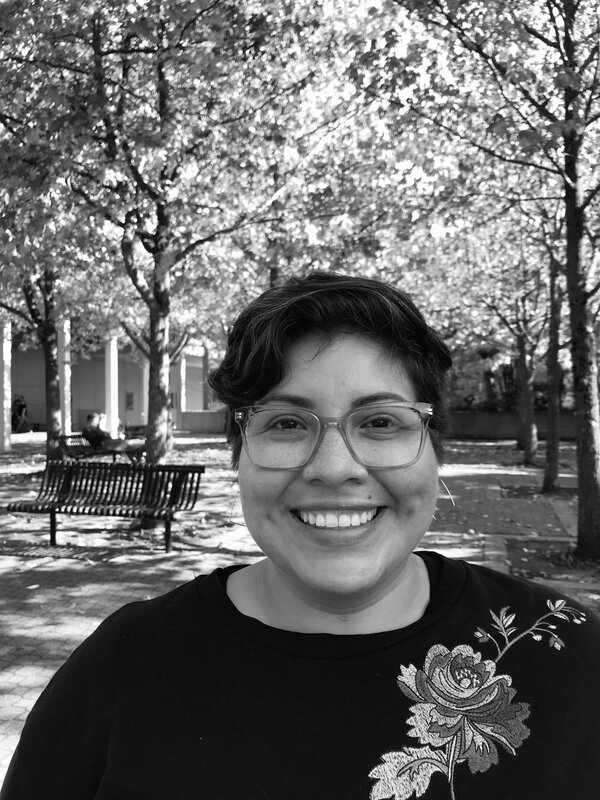 Jessica has over ten years of experience working with community organizations led by people of color from all over the state of Washington in varying social justice issue areas such as farmworker justice, environmental justice, and immigrant rights. She attended the University of Washington Seattle where she received a bachelors degree in American Ethnic Studies with a concentration in Chicano Studies and minor in Labor Studies and Law Societies and Justice. This is her first time curating an art exhibit. Denise Emerson was born in Shelton, Washington, the eldest daughter of Bertha Allen who was an enrolled Twana (Skokomish) Tribal Member and Danny Emerson, Sr. who was an enrolled Diné (Navajo) Tribal Member from Sanostee, New Mexico. Her parents were both creative, and Denise grew up wanting to be like them. Denise’s sketchbook went with her everywhere as a child, including when she visited her aunt on the Skokomish Reservation. During her teenage years, she began painting with acrylics, beading, and sewing to expand her artistic talents, and she later studied graphic design at UW to bring design training to her work. Sara Marie Ortiz is an Acoma Pueblo educator, scholar, poet, performance artist, and Native community advocate/activist. She earned her BFA in Creative Writing at the Institute of American Indian Arts and her MFA in Creative Nonfiction from Antioch University (Los Angeles). Ms. Ortiz has been publishing and presenting her creative work since the age of eighteen and her writing has been published in publications such as Ploughshares, the Kenyon Review, New Poets of the American West, the anthology Sing: Indigenous Poetry of the Americas, Indian Country Today and The American Indian Graduate among many others. She is the author of the mixed-genre collection Red Milk and currently serves as the Native Education Program Manager for Highline Public Schools in Burien, Washington.